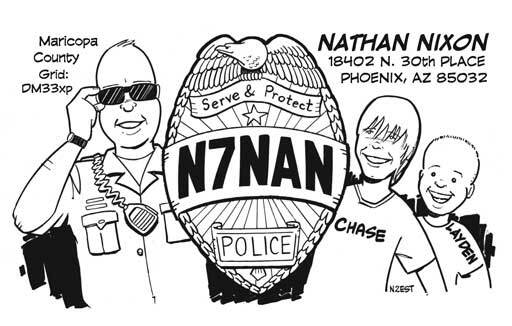 Nathan, N7NAN, wanted a QSL that showed both his sons and his longtime profession as a police officer, so I came up with the idea of making his call sign into a badge. Nathan is also big into emergency communications and is president of the National Tribal Amateur Radio Association. This entry was posted in cartoon QSLs and tagged amateur radio, cartoon QSL, ham radio cartoon, ham radio humor, law enforcement, mobile operation, N2EST, N7NAN, police, QSL. Bookmark the permalink.